The IZB was first hosted in 2001 as a Volkswagen in-house trade fair with 128 exhibitors from six nations, which attracted 13,500 visitors. It has since established itself as a showcase event for the international automotive supplier industry. 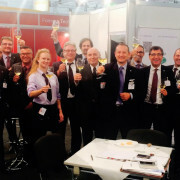 In 2014, the organisers of the seventh IZB recorded a total of 51,000 visitors to the fair held on the exhibition grounds of the Wolfsburg Allerpark, which has an overall area of 36,000 sqm. 821 exhibitors from 29 nations took advantage of the trade fair to showcase their products and innovations. The fair were accompanied by an extensive programme of events running throughout its three-day duration. Leading industry experts will be present at congresses, conferences and forums dealing with current and topical issues in the automotive market.